Juana Alicia reside actualmente en Mérida, Yucatán, México, y residirá en esa bella ciudad durante este año escolar. La Fundación Fulbright Garcia-Robles le ha ortorgado una beca para enseñar en la universidad pública de artes multidisciplinarias: ESAY (Escuela Superior de Arte de Yucatán). En colaboración con sus estudiantes, la muralista creará una obra monumental para la universidad en su nuevo sede en la antigua estación del ferrocarril en el centro de Mérida. Juana Alicia is teaching workshops in Chicana/o Mural History, Design and Technique, which will culminate in a mural at the university’s new location, in the neo-Mayan art deco train station, an architectural jewel in downtown Mérida. ESAY is a multidisciplinary arts university, featuring visual arts, music, theater, dance and film/multimedia. It is a rich and vibrant environment, and the artist is honored to be participating in this dynamic project at the virtual crossroads of culture in Southeastern Mexico. Juana Alicia se encuentra dando cursos en la historia, el diseño y la técnica del mural Chicana/o con el fin de ejecutar un mural para la universidad en su nueva sede dentro de la estación del tren, una joya arquitectónico arte deco en el centro de Mérida. ESAY es una universidad de artes multidisciplinarias que ofrece licenciaturas en artes visuales, música y danza. Juana Alicia quisiera agradecer a la Fundación Fulbright Garcia-Robles, a COMEXUS y a su institución anfitriona por esta oportunidad de participar en un intercambio cultural dinámico en un ambiente de una historia tan rica como la del sudeste de México. Please help us to raise funds for the permanent installation of ten monumental ceramic murals that I have created for Satellite Senior Housing’s Helios Corner Project in West Berkeley. 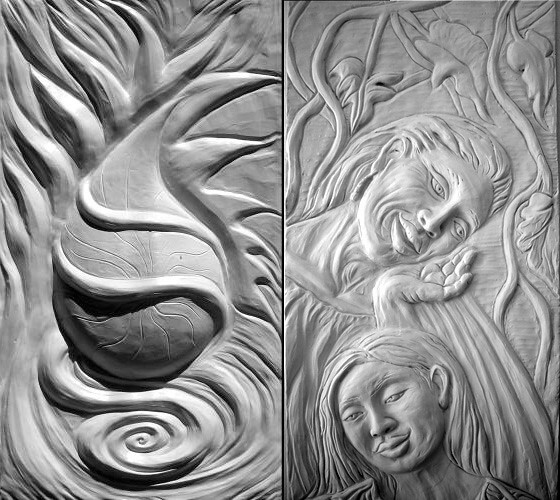 In 2004, I began the site specific works for their anticipated low-income senior housing project for the corner of University Avenue and Sacramento Street, a series of 2′ x 11′ and 2′ x 8′ ceramic bas relief murals for the facade of the now-completed building. I worked for four years to design and fabricate the panels, and finished them in June of 2008. Since then, they have been sitting in boxes in a basement at one of Satellite’s facilities, waiting for installation. Satellite has limited funds for the project, and we still need $5,000 to complete the installation of the panels on the exterior walls of the building. Escucha bien:lo más importantees saber amar. Listen well:the most important thingis to know how to love. La belleza, hija,viene del corazón. As the poetry expresses, the murals honor our nature and the natural world from which we come. They portray the five elements: air, water, fire, earth and the souI, with images of elder men and women speaking to young men and women. The human images emerge from the earth motif. This particular project has the goal of creating artworks at a grassroots level to promote environmental justice in underserved neighborhoods. This is a sustainable architecture program which serves low-income seniors. Although I was paid for creating the murals, it saddens me to have them languishing in boxes. Funds will pay the workers to install the panels on ten columns, facing both the street and an interior courtyard, visible from the street. It is my strong desire to see this work completed and given to the City of Berkeley’s low-income seniors and community at large. Thank you for helping us meet our goal. Conceptually, the pieces represent the five sacred elements: earth, air, fire, water and the soul. The earth panels include images of elders speaking their wisdom to young people, as pictured here. The piece’s central concepts are the contributions to and connections between elders and younger people, and the valued place that our elders inhabit in our community. In 2005, Berkeley poet and elder, Rafael Jesus Gonzalez, who was recently honored by the Berkeley City Council for his contribution to the city’s arts and letters, composed a series of haiku-like verses which further inspired the murals. Their messages to us speak of love for the planet and all living things, caretaking of natural resources and a devotional respect for life. The notion, spirit and story the murals convey is that of a secure, respected home and place in the community for elders, and a welcoming, intergenerational and life-affirming presence in the artwork. It will also celebrate the wisdom of generations through literature. Currently, the murals are boxed and stored in a Satellite facility, awaiting installation. In 2007, Satellite Housing received a grant from the Open Circle Foundation for the installation of the work, but the funds were not sufficient to complete the task. Juana Alicia is currently seeking support for the installation the murals. Please contact her through this site regarding contributions to this project. She is seeking to raise approximately $5,000 in order to bring these sculptural murals to the corner of University Avenue and Sacramento Street. These small tiles shown below are her preparatory sketches for the murals, and the larger works in plastilline and fiberglass are the models for the ceramic panels. During the period of her Fulbright Fellowship, Juana Alicia worked in collaboration with Tirso F. Gonzalez to create the larger pieces at their studio in Mérida, Yucatán, Mexico.